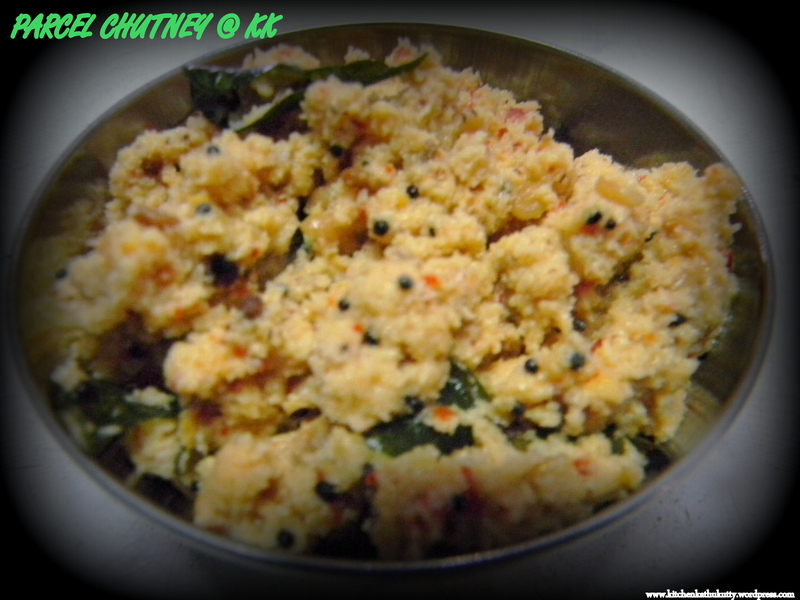 This variety of coconut chutney is made in our family for packing during travel. 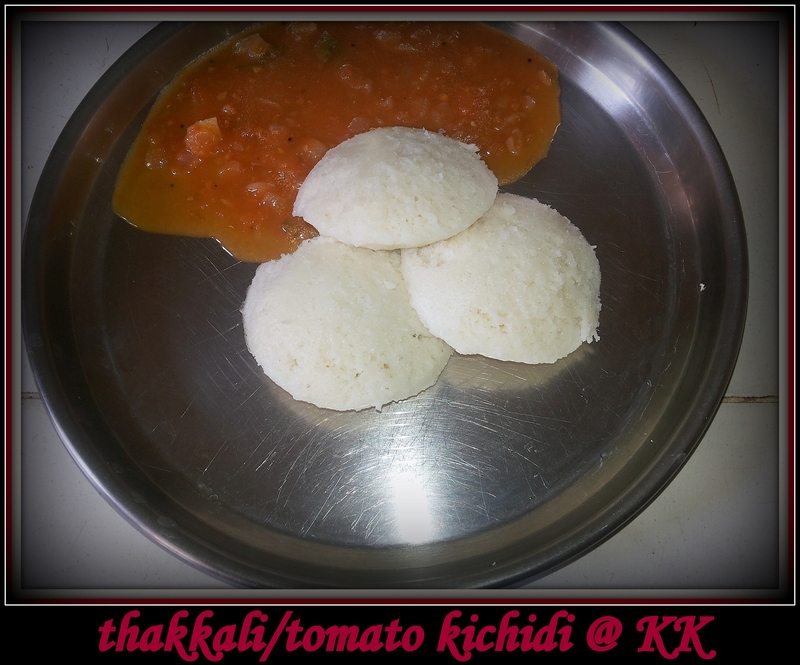 This would stay perfect atleast for two days if you use clean and dry hands and spoon to serve. 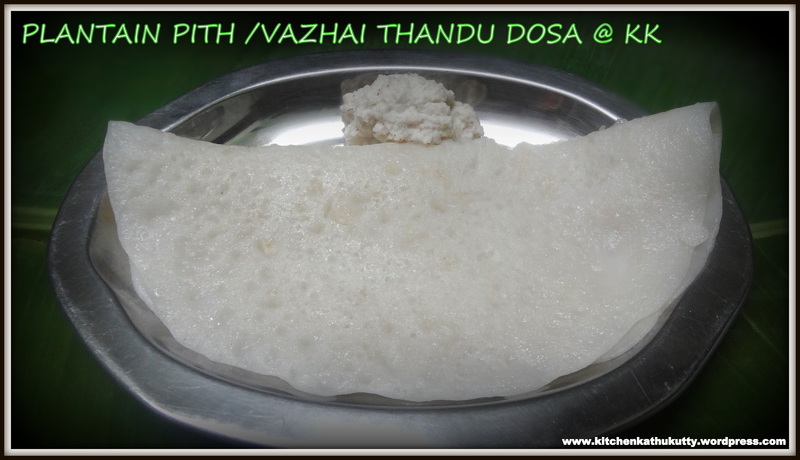 I prefer this as side dish for idly when i have to travel with my little one. Add coconut,red chillies,tamarind and salt and grind it together. When it turns a bit coarse,blend it well and add water. Heat two spoons oil in a kadai and add mustard seeds. 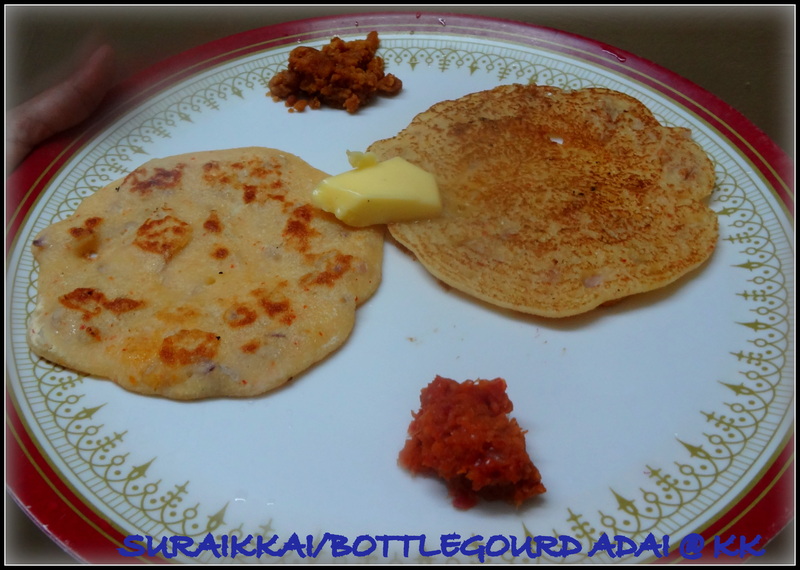 When mustard seeds begin to crackle add urad dhal and curry leaves. Now add the ground paste and saute it well until the water content in the chutney disappears. You can see the chutney separated well and almost very dry. Cool it and pack it in a separate dry container/parcel sheet. This is another version of sambhar from my MIL.The sambhar powder is prepared fresh at home and added,thus the name “arachuvita sambhar”.The choice of vegetable is yours (Brinjal,Carrot,Potato,Pumpkin,Drum stick,shallots,raw mango). I am giving you a version with carrot and potato. 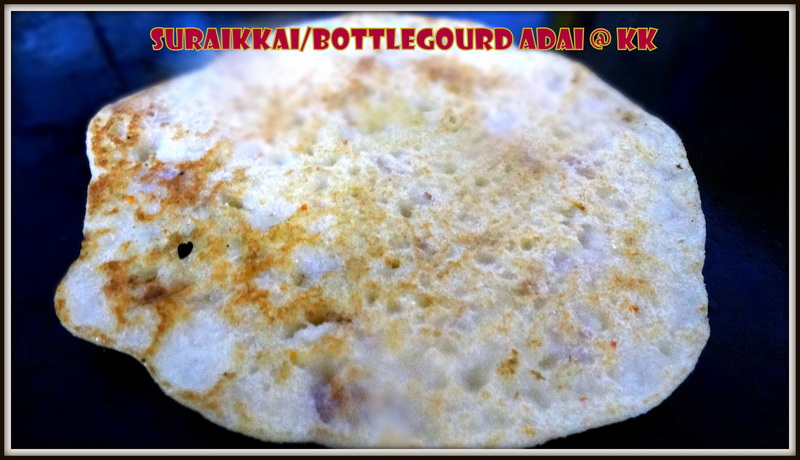 This goes well with rice,idly,dosa. 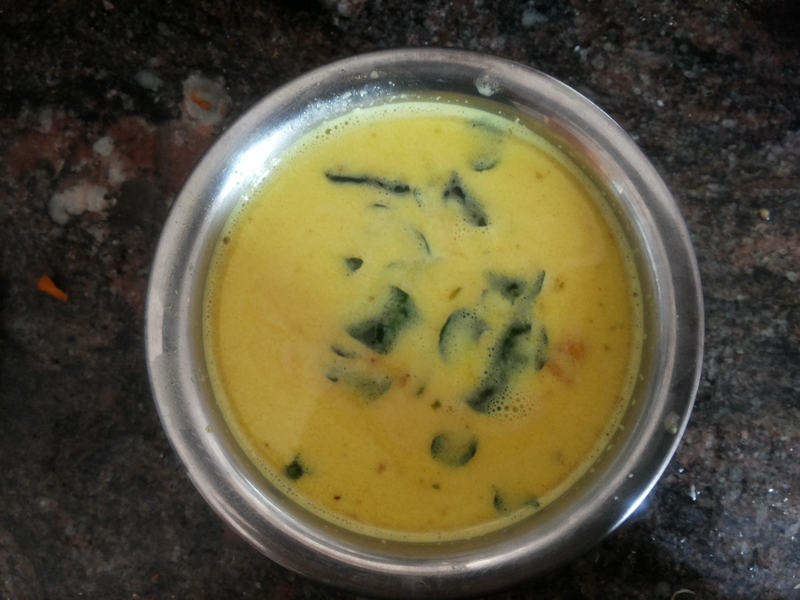 The entire house will be surrounded by sambhar flavour if you opt for this on a day. Wash and soak the toor dhal for 10 minutes. Pressure cook the dhal and set it aside after mashing. 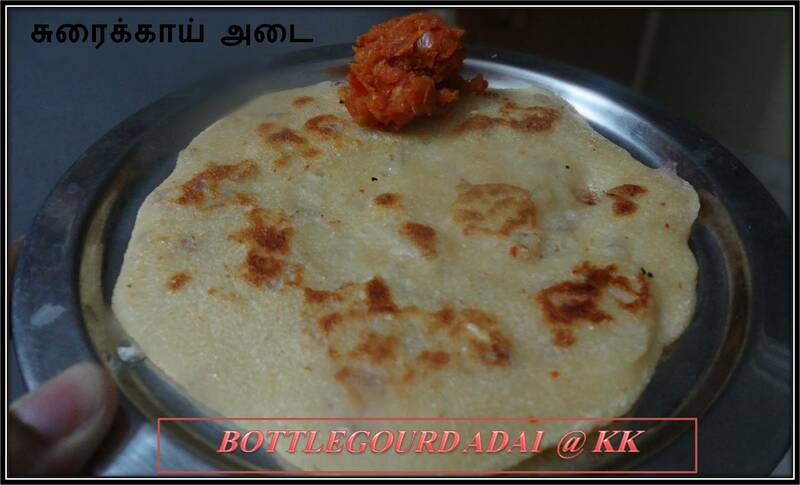 In a kadai,dry roast the ingredients given under”To dry roast and powder”.Once they cool powder it finely. 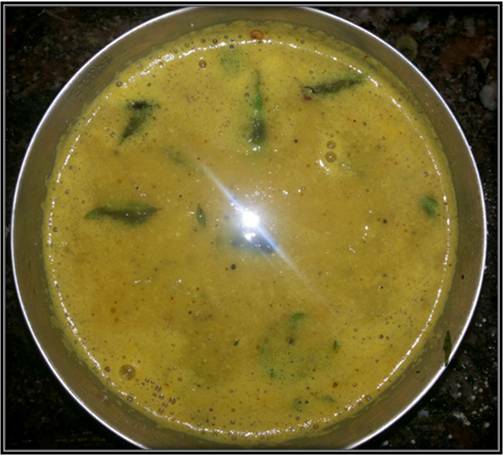 Add oil to a fresh kadai and temper with mustard seeds,urad and curry leaves. Saute onion and tomato until they get cooked. Now add turmeric powder,hing and salt and let it boil. 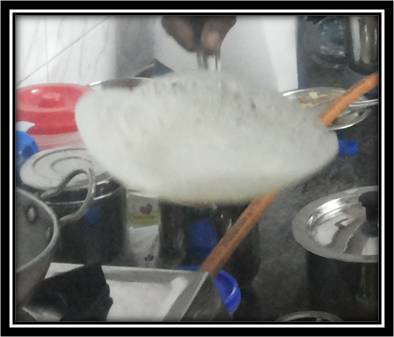 After 5 minutes add the powder prepared and mix the sambhar well. When it begins to boil add the dhal(mashed) and give a quick stir. Finally add the tamarind extract and let it boil for 5 minutes. Serve it hot after garnishing with chopped coriander leaves. Adjust the level of tamarind based upon the taste of tomato. Do not prefer bangalore tomato for this. 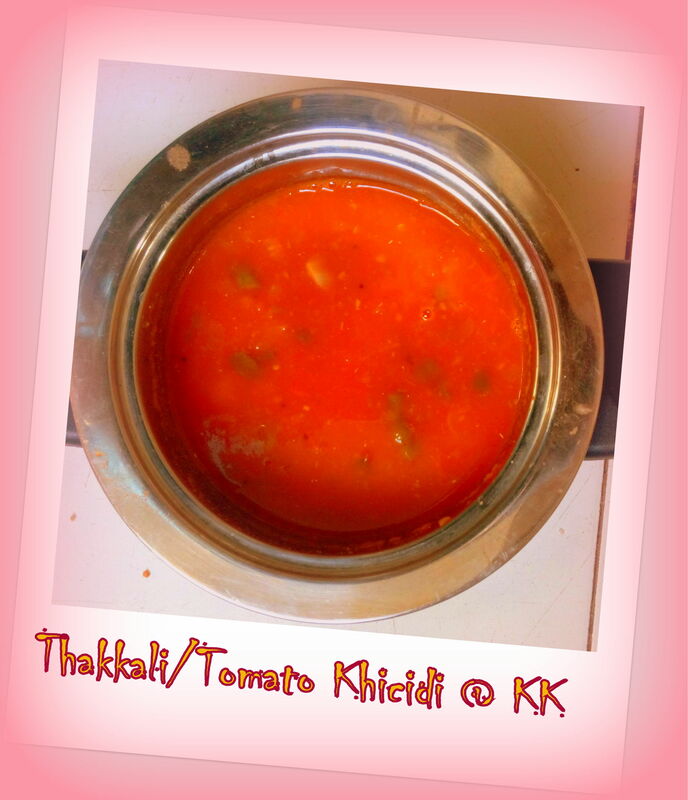 If you are adding raw mango to this sambhar,omit tomato and add very little amount of tamarind extract. Dry roast in medium flame. 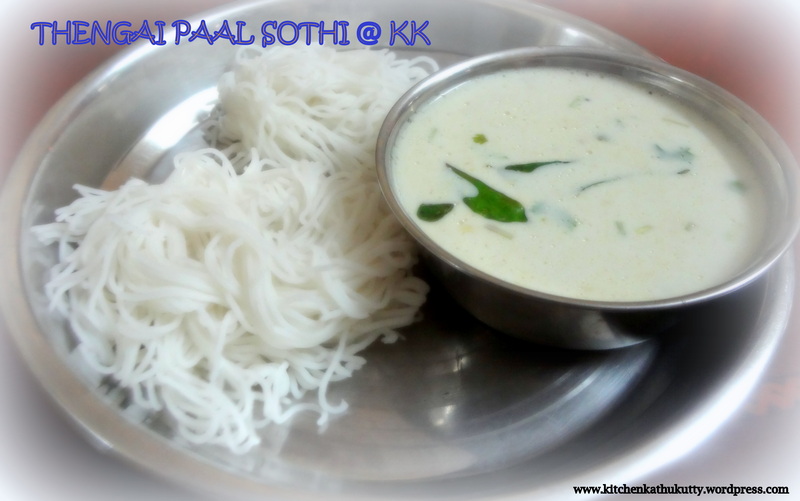 This recipe is an adapted version from a cookery show on Zee TV long back. We were wondering on what to do with the excess corn we had. And fortunately this recipe came up. I personalised to match my husband’s taste and made it as a quick evening snack. 1.Soak the cooked corn kernels and urad dhal for one hour. 2.Strain the water and grind it into a coarse paste without adding water. 3.In a mixing bowl add all chopped items and salt to this paste. 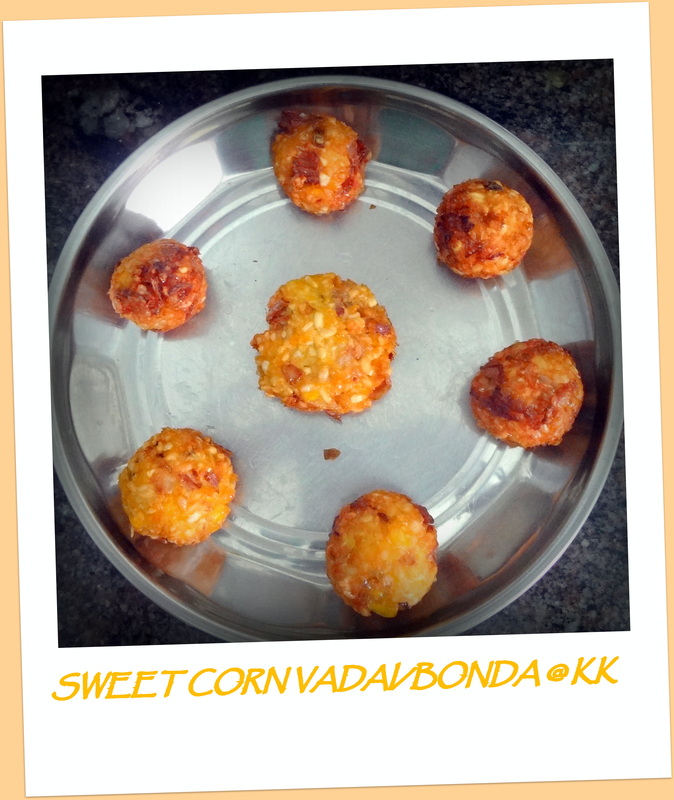 5.Deep fry in oil as vada/bonda. One single run in mixer would make it a coarse paste. Adding American corn will give a special flavour to the dish. This dish was cooked by my MIL during my first visit post wedding. She made it in a jiffy and served it hot. I call it “Athai Bonda”. I even don’t mind to take a plate full of this. It is so yummy 🙂 The usual recipe has maida in large and little cooking soda.But as I am always against using “white elements” much in cooking,she had customised the dish recipe as below for me. 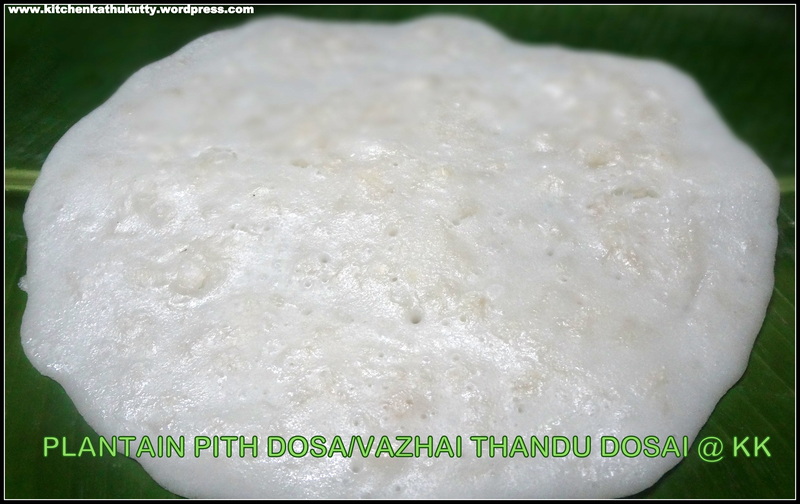 In a mixing bowl add all the flours,sugar,salt and slowly mix it with curd. 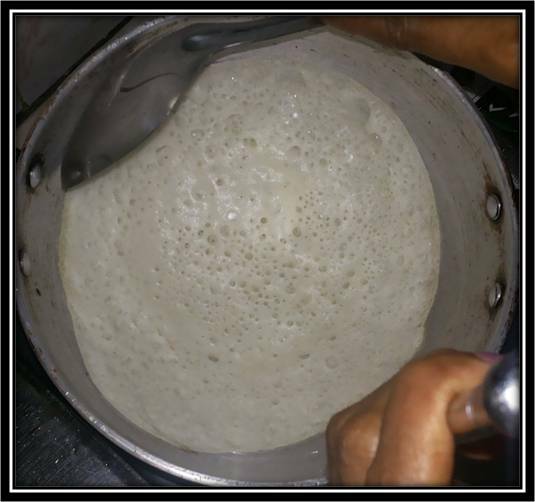 Mix it without any lumps until you get a soft batter which can be made into small balls. You can add little water if you don’t achieve the consistency. Add the chopped onion,green chilly and mix. Dip your hand in water and gather the batter into small balls and deep fry in oil to make bonda. Serve it hot. (The most important part of this bonda). Sour curd and sugar+salt acts as natural yeast. So use of cooking soda can be eliminated. You can try the same with only maida flour. Coconut chutney is the best combo. You can add chopped coconut too.